The Amami rabbit -- a threatened species found only in the Ryukyu Islands -- may become Japan's first endangered animal clone. Scientists at Osaka's Kinki University have cloned an embryo of the endangered rabbit and are awaiting its birth next month, it was announced earlier this week. 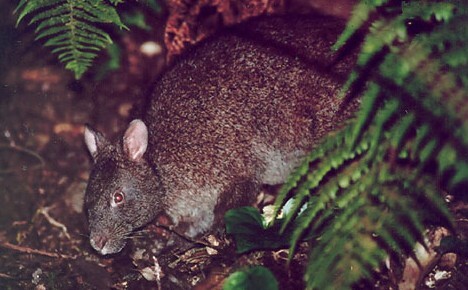 The Amami rabbit (Pentalagus furnessi) is a nocturnal, forest-dwelling "primitive" rabbit with dark fur, short legs, large curved claws and small ears. Found only on the islands of Amami-Oshima and Toku-no-Shima, it is sometimes called a "living fossil" for its resemblance to ancient rabbits that once inhabited the Asian mainland. The Amami rabbit's dwindling population -- now estimated at between 2,000 and 5,000 -- has earned it a spot on Japan's endangered species list. To produce the clone, researchers took a cell from the ear of a dead Amami rabbit and injected it into the unfertilized egg of an ordinary lab rabbit. After the egg developed into the cloned embryo, researchers inserted it into the oviduct of a lab rabbit surrogate. The clone will be born in the coming weeks if the pregnancy comes to term. The chances of success are slim, though, as cloning pregnancies typically have a high failure rate. However, the scientists are prepared to repeat the process until a clone is born. Although some people see cloning as a promising tool for restoring endangered populations when natural breeding is not possible, others argue it is more important to address the actual causes of the population decline. Deforestation and road accidents are major reason for the Amami rabbit's decline, as is the predatory mongoose, which humans released on the islands to control the snake population. Pet dogs and cats also pose a danger to the species. 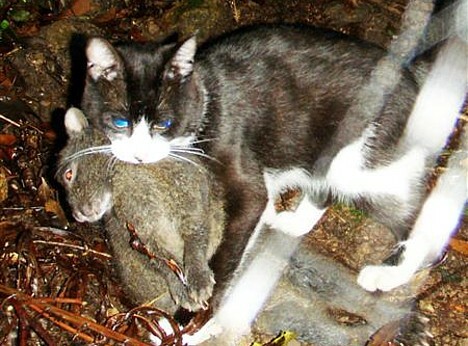 In June, motion-sensitive cameras set up to monitor Amami rabbit activity on the island of Amami-Oshima captured the image of a feral domestic cat dragging a freshly killed carcass through the forest. If the experiment succeeds, the Amami rabbit will join a growing list of endangered animals that have been cloned. Previous examples include the Asian gaur (a rare ox native to India and Burma), which died two days after it was born in the US in 2001, as well as the European mouflon (a Mediterranean wild sheep) and the Junqueira cow (Brazil). Regardless of the outcome, the researchers suggest a degree of caution. Although cloning may potentially be used to preserve rare species, little is known about the long-term environmental impact, they said. Did the cloning work? Is the mongoose round-up in progress? What is being done to save these gentle and delightful creatures?